In James Cameron's new sci-fi movie epic Avatar, the indigenous natives of Pandora, the Na'vi, worship a sacred tree they call the "Hometree." However, the humans who have invaded this Garden of Eden planet are intent on destroying the tree for the precious metal, "unobtanium," which lies beneath it. The humans, you could say, have fallen from grace--they've disobeyed the supreme being and are being punished for their sins against nature. Now they are intent on obtaining this precious metal by any means necessary in order to keep their Earth from dying. There is an interesting piece about the Christian theological aspects of Na'vi at exinearticles.com called "The Theology of Avatar." The Avatar plot can also be seen as being emblematic of the destruction wrought on the gentle natives of the Caribbean (the Taino or Arawak Indians) by its "Discoverer," Christopher Columbus and the Spaniards who accompanied him to what he believed to be India. On December 6, 1492 Columbus landed on the large island of Haiti, which according to Bartholomé de las Casas' account was, "perhaps the most densely populated place in the world." Forty years later, the genocidal depopulation and devastation of the environment was total. According to de las Casas, "All the people were slain or died after being taken into captivity and brought to the Island of Hispaniola [Haiti] to be sold as slaves." De las Casas estimates that in 40 years between 12,000,000 to 15,000.000 men, women and children were killed. These men called themselves Christians. Their reason for killing and destroying so many souls were to acquire a precious metal--gold. Their "insatiable greed and ambition, the greatest evil seen in the world, is the cause of their villainies." Of course, when de las Casas wrote his account, he did not have the benefit we have, of witnessing the infinite greed and corruption of the corporatocracies which run the world today, bulldozing the forests of the Amazon, mining the gold of the Democratic Republic of the Congo and destroying the local environment while plundering Nigeria and other oil rich countries for oil. Trees are the earth's lifeblood and ancient cultures were wise to recognize this. To this day many indigenous cultures worship trees or one specific tree. We know that the scientific method validates that all of Earth's creatures need trees because plants produce oxygen, which is the life-giving air we breath. The energetic spirit in trees and plants connects us to nature. In Avatar, the Na'vi worshiped the tree God Eywa, while in Haiti Voduists worship Loco, the spirit of vegetation in the Vodun religion. 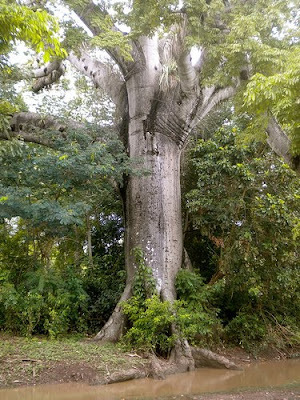 The Mapou tree is known in English as either a silk-cotton tree or a Ceiba tree. 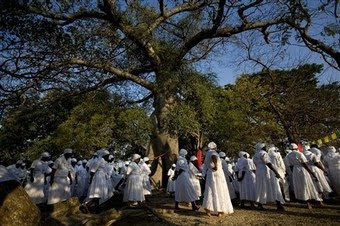 In their holiest of ceremonies, the Mapou tree is central and represents the Voduists' connection to the spirits which inhabit the tree. While the Na'vi summon the spirits by holding hands and chanting in sync, Voduists uses a Ason or sacred rattle for this purpose. Small offerings must be placed at the foot the tree or may be hung on the tree to tempt the spirit forward. Offerings include candles, coins, food and drapos (ritual flags). to the spirits marked by drumming, chanting and sacrificial offerings. The sacred Mapou is often seen as being personified in a respected or heroic figure in Haitian society. When a such a person passes away, Haitians will bestow honor on them by saying, "un gwo mapou tombé" -- meaning "a giant [tree] has fallen." This sentiment was echoed throughout the Haitian community when the Father Gerard Jean-Juste died last year of complications from contracting Leukemia while detained in a Haitian jail unjustly. Unfortunately, the "white savior" theme was evident in Avatar, and many people saw parallels to Tarzan of the Apes, the Disney animation cartoon Pocahontas and the Kevin Cosner opus, Dances with Wolves--but on a more positive note, Avatar emphasized our deeply rooted connection to each other and to nature. It is our sacred duty to protect the environment, because if we cannot, we are destined to perish from this Earth. Ezilidanto has a historical perspective based on recent events in Haiti, check it out at OpEdNews: "The Avatar Movie from a Black perspective." Nice post, Chantal. I have no interest in seeing Avatar, but I heard there's a scene where a scientist character refers in a derogatory way to 'Vodoun.' So the comparison between the tree in the film and the Mapou takes on extra significance... the film appropriates and exalts elements from Haitian Voodoo culture even while expressing the usual colonial condescension towards it. Ansel- You should go, the special effects are great, though the plot is not thick!